Who knew that one little dryer sheet could do so much? Finding laundry care products that work for my entire family is a top priority and Purex has a variety of products that I love, trust and count on! This giveaway will end September 6th at Midnight EST. Disclaimer: The Being Frugal and Making it Work family received complimentary Purex Fabric Softener Dryer Sheets for the purpose of writing a review and hosting a giveaway. Regardless, I only recommend products or services I would use personally and/or believe will be a good fit for my readers. The views and opinions expressed on this blog are based purely by our own experiences. No monetary compensation was received. Results may vary. I love the Purex Naturals laundry soap. It has a wonderful smell. I would choose Mountain Breeze. I would choose the Mountain Breeze.. I got a sample of these and they smell amazing. I love Purex Detergent. One of my favorites is Purex Natural Elements. I am currently using the Tropical Splash scent and really like it. I would use Sweet Lavender for my daughters' clothes, my clothes and towels. I'd use the Mountain Breeze Scent on my husband's clothes. I love their Purex Natural Elements. I use the Linen & Lilies scent but still want to try the Lilac & Lavender scent but I haven't been able to find it. I love all the Purex products!! I use the Purex Oxi, they are all reasonable priced and great quality! Right now I am using Purex with Zout and it works really well. I also like the scent of Purex Crystals in my clothes. Can't wait to try the dryer sheets. If I had to choose one of these scents I would choose to try the Sweet Lavender one first. I HAVE NEVER TRIED THIS PRODUCT I WOULD LIKE TO TRY THE LAVENDER ONE I THINK THATBIT WILL SMELL GREST. I like Purex Softener Crystals (Baby), because I have sensitive skin and it does not irritate me. My favorite Purex product is Purex Crystals for baby. I am so completely addicted to the smell. I have no babies in my house and it may be odd for me to be buying a baby product, but I really love it! I would like to try the Mountain fresh scent first. I was smelling the boxes in the store a couple days ago to check them out. I would love to try Purex plus Oxi to help fight the stains of my 1 and 4 year old! My favorite product of theirs is the Purex Crystals - I love their selection of scents and they keep our clothes smelling fresh! I would love to try the purex crystals! I like the Purex Natural Elements. Hypoallergenic and dye-free works best for my family. I would like to try the purex ultra packs. I really like Purex's Free and Clear detergent. My whole family has sensitive skin and we've never had a problem when using that product! 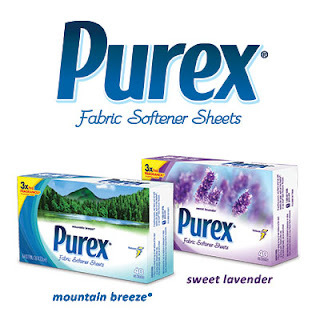 I really want to try the new purex sweet lavender dryer sheets. Lavender is one of my favorite scents. I'd love to try the Sweet Lavender Dryer Sheets. I also love Purex Free and Clear Detergent because everyone is my home has very sensitive skin. I absolutely love the Purex Crystal. It does keep your clothes, towels smelling wonderful for a long time. I'd like to try the Sweet Lavendar sheets. I'm not sure I'd want to use it on clothes I wear but would use it on towels and sheets. 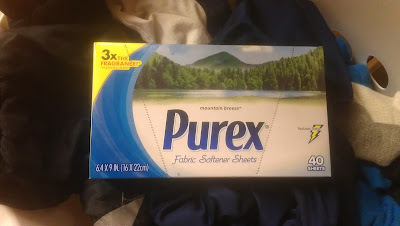 The purex products that I like is the purex ultra packs. I also like the purex crystals. My husband is a GM @ McDonalds so Purex with Oxi is something I would like to try- anything to keep those uniforms smelling good and clean! I love the purex crystals. They make your laundry smell great!